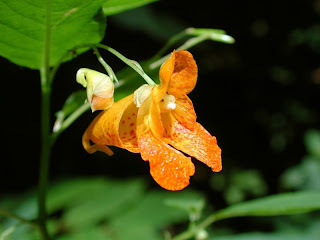 Annisquam Herb Farm: Orange Jewelweed . . .
Orange Jewelweed . . . If you have been exposed to poison ivy, oak, or stinging nettle use the jewelweed plant. Slice the stem. Rub the juice inside on exposed parts which usually prevents breakout for most people. Use also to ease the irritation. Brew chopped jewelweed in boiling water until you get a dark orange liquid. (Yellow Jewelweed will not yield orange color and may not be effective.) Strain the liquid. Pour into ice cube trays. Rub the skin with a jewelweed cube when you have a skin rash. It will keep in freezer up to a year. Put 2 ounces of dried jewelweed or 4 ounces fresh jewelweed and 2 cups of olive oil in a double-boiler on very low heat and let the herb "cook" for 1 to 2 hours. Strain into a sterilized jar. Gently heat 1 oz. beeswax in the top of a double-broiler type pan until melted. Add 1 cup of the infused oil. Wax will solidify a bit. Heat gently only until wax melts again. Stir until mixed together. Pour into containers. Let cool and cover.